Zasnovano za novo dobo namenskih omrežij, stikala Catalyst serije 9000 združujejo programirljiva integrirana vezja za določen namen (ASIC) in programske inovacije ter s tem prinašajo najboljšo učinkovitost in funkcionalnost ter napredek na področju varnosti, IoT ter oblačnih storitev. Stikala Cisco Catalyst serije 9200 nadgrajujejo moč namenskega omrežja ter programskih in strojnih inovacij serije Catalyst 9000 in s tem omogoča širši nabor aplikacij. Our best-in-class security portfolio is anchored by Talos, Trustworthy Solutions, MACsec encryption, and segmentation. Get advanced security features that protect the integrity of your hardware, software, and all data that flows through the switch. Catalyst 9200 Series switches provide enterprise-level resiliency, analytics, and assurance to keep your business up and running seamlessly. FRU power supplies and fans, modular uplinks, cold patching, perpetual PoE, and the industry's highest mean time between failure (MTBF) make Catalyst 9200 Series switches stand out against other switches in their class. 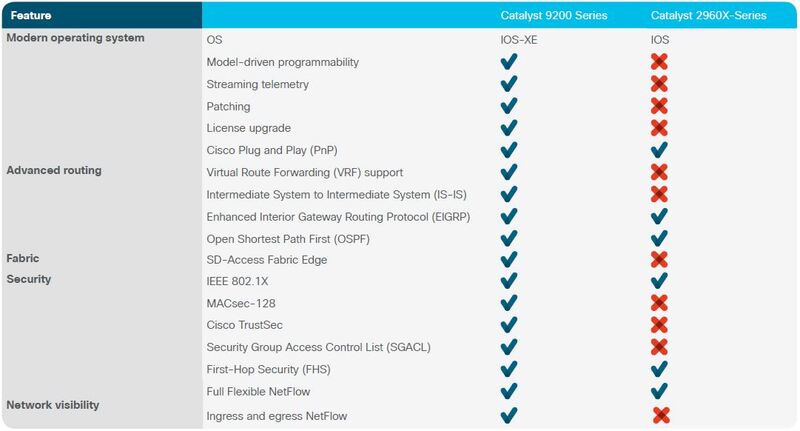 Get a simple web UI or Cisco DNA Center provisioning, combined with the open APIs of Cisco IOS XE and the programmability of the UADP ASIC technology. 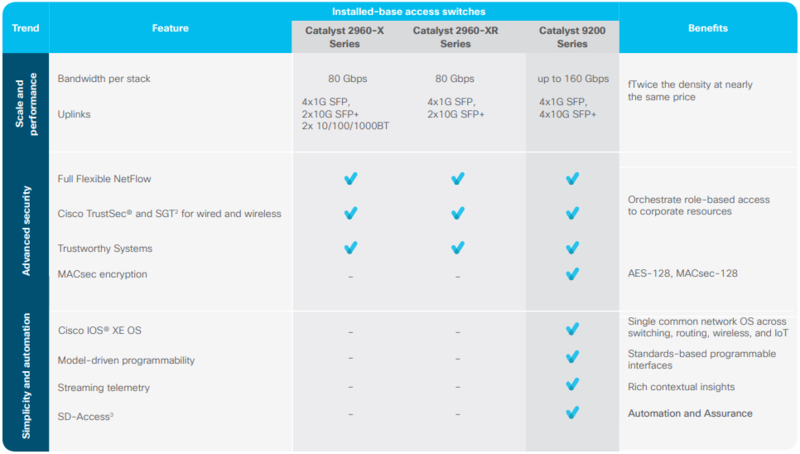 Catalyst 9200 Series switches provide simple operation now with investment protection for future innovations.